Happy Father's Day! | The House of Martins The House of Martins: Happy Father's Day! Well tomorrow is a big day for dad's everywhere - and in honor I thought I'd share this infographic: How your dad's music influences your taste. Does your dad listen to the Greatful Dead, Beethoven, Miles Davis or Iron Maiden? I think they should have a few more options... but I'll go with what they offer. If you showed this infographic to my dad - he'd ask you where the Emmylou Harris choice is. 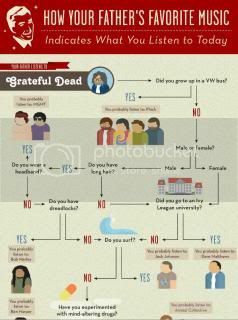 I'd say the closest of these choices would be the Greatful Dead for my dad... and if I follow the little chart, it tells me I listen to.... Ben Harper! Who I do really like, so ok, I guess it says something. Since I own all of his old LP's now - I guess I already knew he had some influence. Love to my dad, the new dads, the future dads and all the other dads out there!